Just Another Kimono Blog: A new year, a fresh start??? A new year, a fresh start??? It has been a very very long time since I've worn kimono! The last time was to the Floriade with 3 other members of Kimono de Jack NL last September. That means I can honestly say last years resolution of Every month a kimono didn't last... It went well until July, August didn't happen 'cause of my summer holiday, September was KdJ and that was the last of it. At least I've made a good start! Last Friday at a comicbookshop there was a booksigning by the French artist HUB. He's the artist and writer of the comic-series Okko, a ronin in a land that is a combination of ancient Japan and fantasy (because of all the demons). His drawings are very beautiful and I think very accurate (but I don't know that much about Japanese history). So I decided to go in kimono. Unfortunately I don't have any photo's, but I wore my olivegreen houmongi with the orange/peach obi with (royal) cart on it. 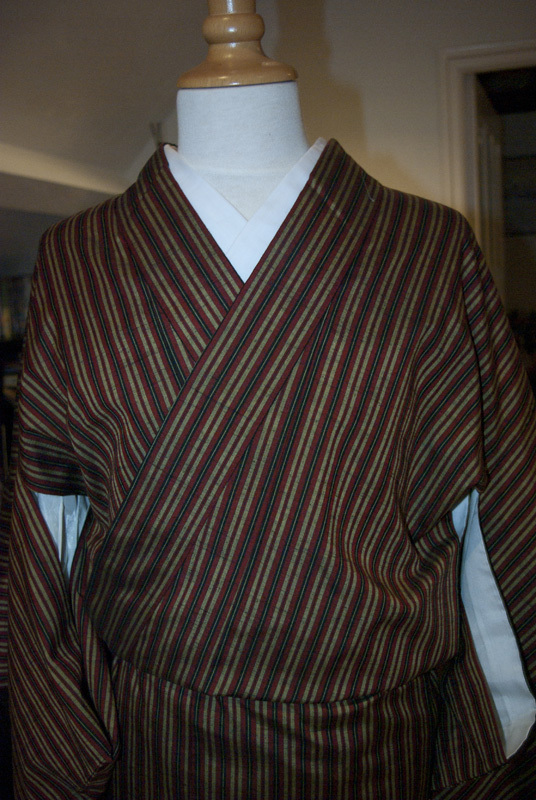 I chose this kimono because it's of perfect lenght and nice and warm. Of course because of the cold weather here, I wore lots of layers and luckily didn't feel cold. So today I decided to do some more kitsuke. Not on me, but on one of my dummies. 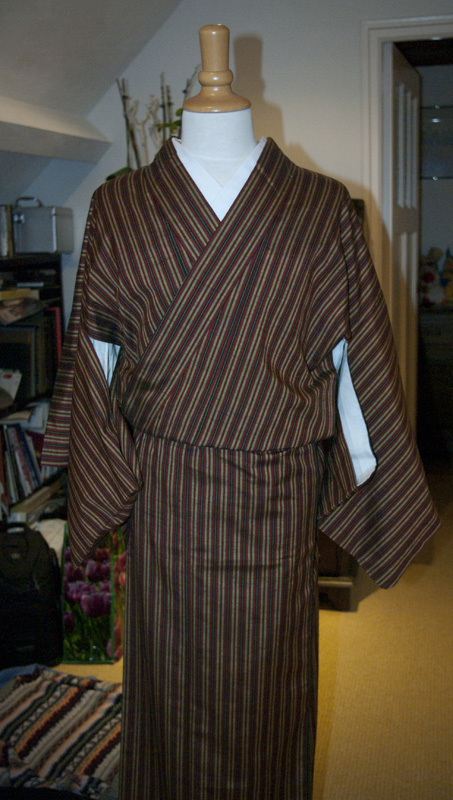 And I totally forgot how difficult it can be do put a kimono on a dummy. Putting the obi on took me 3 tries before it was on, and whèn it was on, it was way too low... Grrr... So now I will show pictures of a kimono on a dummy without an obi! This kimono was previously owned by the lovely Lyuba of Strawberry Kimono. Together with this beautiful juban (with cure haneri fastened on it) and 4 obi they are the first kimono-purchases this year. I still have to take pictures of the obi, but once that's done I'll share them. 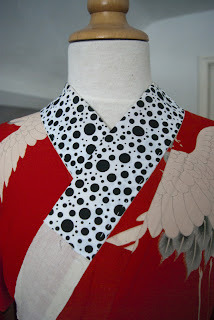 Love how the polka dot collar gives this beautiful red Japanese kimono a modern touch.